This month Janaki Srinivasan presented at the ICTD conference on her project revisiting the site of a canonical study on mobile phone use by fishermen in north Kerala. The original study (by economist Rob Jensen) showed compelling evidence that fishermen used mobile phones to check prices at different beach landing sites leading to improved efficiency in the market as a whole and welfare gains to small and large-scale fishermen. In our revisit we sought to explore the use of mobile phones in this industry more broadly and to consider the history of the region, the groundwork that made these efficiency and welfare gains possible. In the process we raised issues about the potential to scale ICTD results across politically/historically/economically heterogeneous regions. Our findings also question how policy-makers and technology designers might go about drawing ‘implications’ from such studies. Phones were also mentioned in the context of coordinating or balancing work and home concerns, most often by women vendors who operated in south Kerala. 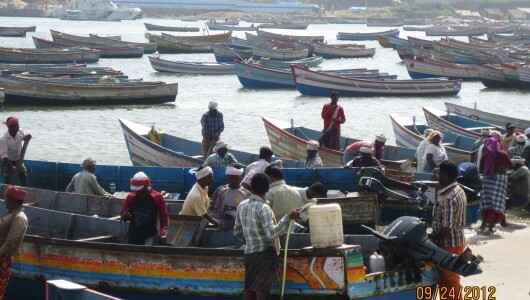 With the growth of fish exports, the presence of export company agents on the beach and the entry of cheaper fish from neighboring Tamilnadu, small-scale vendors are increasingly being marginalized in this region. Many small-scale vendors in this region have started traveling to markets in Tamilnadu to buy cheaper fish. Women comprise a part of this population that travels long distances everyday to purchase fish. A woman vendor’s work day, which includes traveling by public or hired transport because she doesn’t own a vehicle, attending an auction, purchasing fish and selling it at a market or at individual houses, can last longer than 12 hours. Since women are also seen as the caretakers of this family in the prevalently patriarchal structure of the region, they worry about their families and their children throughout the day that they spend away from home. Many of them mentioned that having a phone helped them inform their family of their schedules and delays, know what was going on at home, and relieved them of constant worry. The varied uses of the phone among these actors are matched by almost as many understandings of ‘welfare’ in their lives. People did not define their well-being or welfare primarily in terms of their income, or in terms of optimizing it. Many of them, especially the owners and crew of vallam and gillnet boats, and small-scale vendors, spoke instead in terms of managing or coping. They spoke of their physical and mental well-being, sometimes prioritizing that over an increased income (such as fishers who spoke of wanting to sell quickly and move on to rest, rather than wait to get the best price). The survival of a fishing unit lost at sea or caught in a storm is, of course, critical to fishers’ own long-term welfare and that of their families. Fishers and others in the fishing supply chain spoke also in terms of maintaining relationships, with fellow fishers, their auctioneers, or regular buyers, rather than solely in terms of optimizing their incomes (as reflected in practices of sharing fish-finding locations). These practices may very well eventually lead to improved incomes, but in a longer term and less easily measurable way. They also lead us to ask if Jensen’s definition of the fisherman’s problem as “maximizing profits by choosing where to sell their fish” or concluding with income increases as “welfare benefits” doesn’t narrow our understanding of the reality of the fish market.